To start off my Vegan Thanksgiving Series, I was going to talk about the foundation of all cooking, which is making a really good stock, but I decided that I didn't want to bore you right from the start. So lucky for you my first dish is an appetizer that can be served on Thanksgiving or any time you entertain. It doesn't matter how much I plan my Thanksgiving dinner--including a weekly time line, typed grocery list broken down by departments, or a detailed prep list, I am always running behind. If I tell everyone that dinner starts at 5:00pm, I can guarantee you that it won't be on the table until 6:30pm. On Thanksgiving most people skip eating breakfast and lunch in anticipation of gorging themselves at dinner. So if you're a guest at my house you are going to be really hungry unless I serve you something to tide you over while I'm running late. Now my husband is quite happy eating an entire bag of chips while waiting, but how good is that for you and there's no fun in it for me either since I enjoy cooking and serving delicious food! Serving this bruschetta is great because the sweet onion soubise and the balsamic glaze can be made up to three days in advance. The mushrooms only take minutes to roast and if your oven is full with other items, you can always grill or toast the bruschetta. Also, it can be served at room temperature--just don't dress the arugula until you're ready to serve or it will wilt. Drain cashews, place in a blender, add water and blend on high for up to four minutes, depending on your blender. Strain and set aside. You'll need 1/3 cup for the recipe. You can freeze the remaining cream, or add agave to it and serve it with your breakfast cereal. Heat a small sauce pan on medium-low, add olive oil, onion, garlic and thyme and saute until onions are soft. Do not brown the onions, you want them to remain light in color. Deglaze with white wine and cook until reduced. Add cashew cream and simmer, stirring frequently until onions are creamy and most liquid is absorbed. Season with salt and pepper and place in a blender and blend on high until smooth. Pour into a bowl and set aside, or store in the fridge until ready to use. Remove stems and slice shiitake mushrooms. Rip oyster mushrooms into like size pieces. Toss mushrooms in a bowl with thyme, olive oil and salt and pepper. Place mushrooms on a sheet tray(s) and roast in the oven for 10 minutes until lightly golden brown, checking and turning the mushrooms half way through the cooking process. Brush both sides of bread lightly with olive oil and sprinkle with salt and pepper. Bake in the oven for about 10 minutes, five minutes each side until slightly crispy. 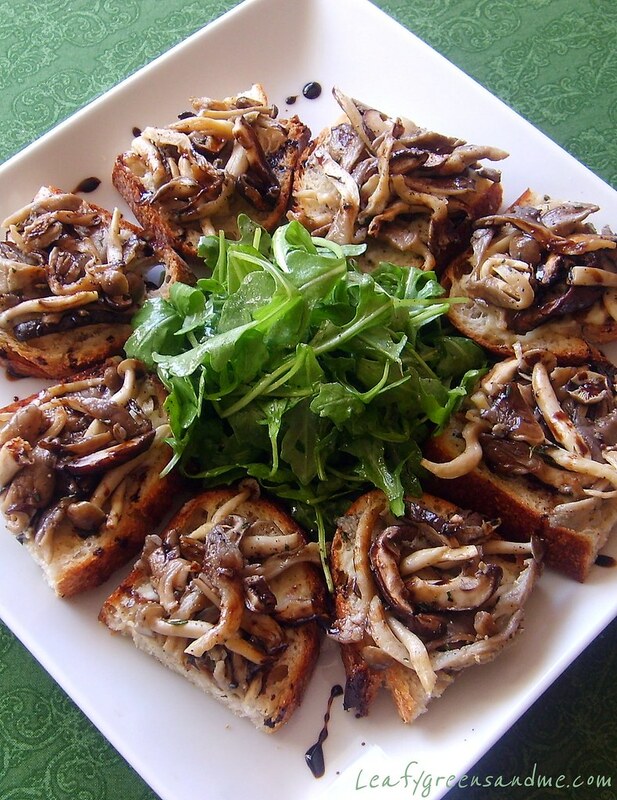 Spread soubise on toasted bread and top with roasted mushrooms. Slice bread in half and arrange on a serving platter. 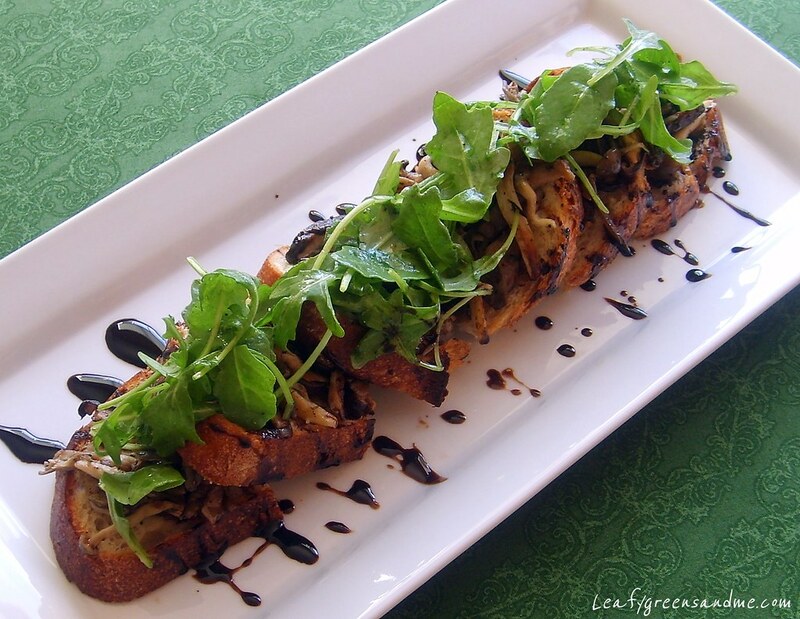 Drizzle balsamic glaze over bruschetta and top with arugula, tossed lightly in lemon juice, olive oil, kosher salt and black pepper. Amymylove, unfortunately dried mushrooms can be really tough when re-hydrated and so I would not recommend them as a replacement to fresh mushrooms. Yes, making a mushroom stock is the best way to use them, but I also grind them in a spice grinder and use them as a seasoning to flavor other dishes. You can use the powder to flavor burgers, risottos, and sauces, anything you want to impart a earthy flavor to.